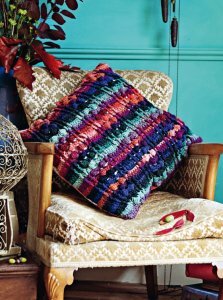 Taken from Hooked on Noro: This cute cushion cover paired with a matching fabric makes a large size throw pillow that looks great in any room of your home! This pattern is from Hooked on Noro, pg 27 - Berry Cushion Cover. Size US 4.5mm crochet hook (or size needed to obtain gauge), 20.5" x 20.5" of fabric backing, and a 20" square pillow are required but not included. Only yarn is included in this kit. The book and hook is optional. Fabric and pillow are not currently available from Jimmy Beans Wool. Finished Measurements: 20" square after blocking. Gauge: 13 sts & 7 rows over 4". $50.00 -- Kit price including yarn only (no book or pattern).